Ready & spiced. Great for pickled onions & aromatic beetroot. Suitable for vegetarians. "The proof of the pickle is in the eating" Helpful Hints for Better Pickling 1. Use prime, fresh ingredients, carefully cleaned. 2. To prevent marks occurring when peeling, use a stainless steel knife. 3. Use only stainless steel, enamel or non-stick pans. 4. Clean glass containers before use by thoroughly washing in hot, but not boiling water and then drying in a cool oven. 5. Ensure that the pickles are completely covered by vinegar. 6. Ensure that the lids are airtight. 7. Label and date each jar. 8. Store in cool dry and preferably dark place. 9. Jar hold approximately 1kg (2lb) veg or 12-15 eggs. Home pickling is so much easier when you use Sarson's Pickling vinegars. 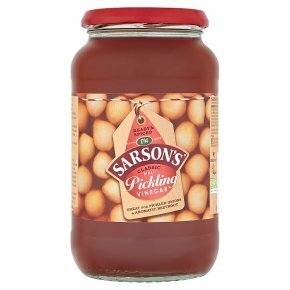 Vegetables have a high water contents which dilutes original vinegar, but Sarson's Pickling Vinegars are brewed to a special pickling strength so that your pickles will be better preserved. Sarson's is also ready spiced, so you do not need to boil the vinegar and spices together, just use it straight from the jar. This is a natural product, as the vinegar matures a sediment and darkening of the vinegar may occur.